Someone seeing this post would obviously assume that this is something that Dr. Kent Hovind is sharing, approves of, and wants everyone to watch. However, that is NOT the case. Dr. Hovind has REPEATEDLY demanded that he be in control of the contents of his facebook page and blog. 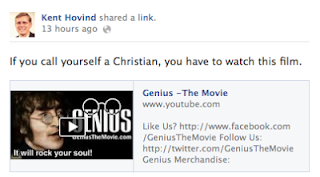 Here is what Dr. Kent Hovind actually says about people posting things in his name. One more thot on the face book page issue you sent me this morning- I can already predict the response, "Dad! You love Ray Comfort and sell his stuff and recommend him all the time! You have stayed at his house and preached with him! You sold his books. What is the issue? I never dreamed that would be a problem!!" Eric, and some in the family, will NOT see, recognize or admit the real issue in all this. The above will be the 'cover story' for why it was done as was. They REALLY don't see it brother and they REALLY will have (feigned) indignation over my statements on this. I thot I'd wait a few hours to add this so my prediction will get there AFTER he responds (if he does) or at least has the above internal reaction in his heart. Paul made it PUBLIC in II Thes 2:1-3 that he did NOT send that letter about the Day of Christ being past already. There are BILLIONS of copies of his proclamation in print today! I'm NOT trying to cause trouble or make people mad! I'm just trying to point out what I see and some others don't. :) I'm the innocent victim here. I'm really a very nice guy! Actually, I'm the nicest guy I have ever met in my HUMBLE totally unbiased opinion! :)) We will see what God thinks about that one day soon! I HOPE He agrees and says, "Well done..."
I'm Kent Hovind and I approve this message! This message may be shared if unaltered. This is the OFFICIAL KENT HOVIND PAGE, under the operation of CSE & God Quest Ministries. Well, there you have it. It is under the operation of GQ, and NOT Kent Hovind. actually aren't that bad, etc, etc. "If you call yourself a Christian, you have to watch this film." Your last 2 blog posts have not shown up on this page. Instead "you"
Christmas shopping at the Creation Today online store. Our family saw the film & didn't like it at all. Instead of a finding a clear presentation of the gospel message, we left with an odd sympathy for John Lennon-completely misplaced & unbiblical. That is probably why the film is not doing as well as they hoped. Newtown, Connecticut . . . one more reason to home school. I something to add about Connecticut Janet. Connecticut was another inside job, planned by the same people that have pulled all the little pranks on the population so far. I'll cut it short: they want to disarm the people then ... all hells will break lose. It's gonna happen sometime soon now, since their problem-reaction-solution trikey never tumbles over. I'm too tired to explain further... I think most people here know what I mean. Welcome to the end of days.